January 16, 2019 – Tickets are on sale for the Sanibel Historical Village’s annual fundraising gala. This year’s theme is “An Evening on the Old Algiers.” The event takes place February 19 at 6 p.m. at The Community House, 2173 Periwinkle Way. There will be a buffet dinner provided by the Sanibel Catering Company by Bailey’s. Beer and wine are included in the price of the ticket. Tickets are $135 each and can be purchased at www.sanibelmuseum.org. 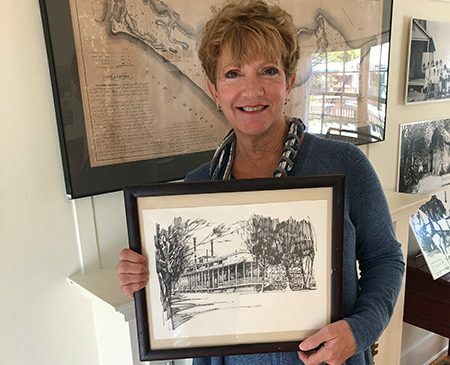 The evening will offer the chance to learn more about the Algiers river boat, which almost became Sanibel’s first “mega mansion.” It was brought to Sanibel from New Orleans. It was floated ashore via a trench dug on the beach that is now Gulfside City Park. Unfortunately, the owner died and the boat was never lived in. After auctioning off as much as could be removed, the rest, considered a hazard, was burned by the city as practice for island fighters. The bell and the anchor are on display at the Sanibel Historical Village. This year’s sponsors include: Allegra Printing, Times of the Islands, John Grey Painting, Sanibel Captiva Beach Resorts, Bank of the Islands, VIP Realty, and Sanibel Captiva Trust Co. Individual sponsors include: William and Gail Bachman, Liz Clark, Ralph and Billye Curtis, Garlinghouse Foundation, Neal and Sherry Halleran, Pete and Jan Halliday, John and Jane Henshaw, Robert and Jane Holder and Sheila Barboza, Friedrich and Daniela Jaeger, Karl and Jeri Magg, Edward and Dorothy Miller, Kevin and Deirdre O’Donnell, William and Stephanie Rahe, Ron and Faith Souders, Rod and Gerry Verblaauw, and Alex Werner and Karen Storjohann. The Sanibel Historical Museum and Village is open Tuesdays through Saturdays from 10 a.m. to 4 p.m. Full guided tours take place at 10:30 a.m. and 1:30 p.m. at no additional charge, depending on docent availability. The Sanibel Historical Village is located at 950 Dunlop Road (next to BIG ARTS) and there is handicap access to the buildings. Admission is $10 for adults over 18. Members and children are free. For more information or to make a donation, visit www.sanibelmuseum.org. To purchase tickets to the Village’s February 19 gala fundraiser, “An Evening on the Old Algiers,” go to www.sanibelmuseum.org and click on the red “GALA” tab on the right-hand side.